This is an easy read. It’s typical of the genre and includes details of “Mark Owens” career that will seem like familiar territory to those who have read similar accounts of Seal training and operations. At the same time there are weird and vaguely troubling discrepancies in a book that by all accounts has been fact checked and dissected by the publisher and various lawyers to ensure that no operationally sensitive material is released. Even though he is a member of the U.S. Navy it seems unlikely that the author doesn’t know the caliber of weapons commonly in use by other U.S. services, why then does he misidentify the size of cannons used in the Bradley fighting vehicle, the AC-130 gunship and the F-16 fighter? There are some in the U.S. Special Forces community who are apparently not happy with the publication of this book or its author. 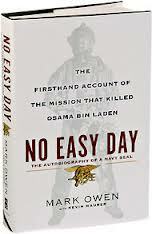 In fact the book seems like part of a continuing effort to shape the story of the Bin Laden Raid. This is very much the official version. There is no mention of any one outside U.S. intelligence, or even any one on the ground, at any time, having anything to do with the operation. No mention is even made of the special nature of the MH-60 “stealth” Blackhawk helicopters that flew the mission, but given that, according to this account, they were accompanied by distinctly non-stealthy CH-47 Chinooks it would appear that they were valued more for their low decibel levels then their low radar returns. On that note it should also be related that one of the few revelations in the book is that the Seals assaulted directly into the compound, rather then landing elsewhere and hiking to the objective as is common practice, because there was no other good place in a modern urban setting to land. Aside from being timely and ultimately enjoyable as reading, there are a few things that can be learned from “No Easy Day’ that are applicable to the Canadian experience. First, the ease with which Special Forces can grow. Seal Team Six has metastasized from a “platoon” sized operation with seventy-five “shooters” to the battalion or better sized “United States Naval Special Warfare Development Group (NSWDG), or DEVGRU”. The same thing can happen in Canada where JTF-2 (1) continues to grow and the Special Forces community now includes the Canadian Special Operations Regiment (2). Special Forces often seem like an easy answer, particularly in peacetime, for politicians and Generals and their limitations are seldom on display. There is also the issue of resources. Special Forces need huge amounts of training, specialized equipment and intelligence products to be effective. All these things cost money and may take resources, and valuable personal, away from regular units. At some point an “operator” who is three or four times as affective as a regular infantry soldier but who costs ten times as much to field could be seen as being non-cost effective. In the final analysis using Special Forces is rather like calling in Air Strikes, there is the promise of surgical cleanliness and a quick end to problems. Like Air Strikes, it doesn’t always work out that way, and even when it does it doesn’t always deal with the real underlying problems. Osama bin Laden may be dead, and it may please the U.S. public that this is so, but, as events in Mali and around the world prove, it doesn’t solve the problem of al-Qaeda or the anger that spawned it.